They Sell Chocolates Here Don’t They? 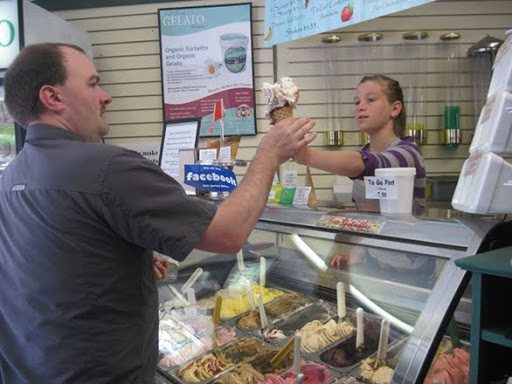 E: I’d have to say no trip to Salt Spring Island on a warm summer day will ever be complete without a trip to Harlan’s Chocolates & Gelato. This place can give Willy Wonka a run for his money, but instead of a gold certificate, it’s a munch card. And after 10 purchases, you get a prize. J: Yes, there was a small line-up between me and my golden ticket (gelato) but it only made my picking of one among many interesting flavours more rewarding. I settled on two scoops of Kinder Surprise in a chocolate dipped waffle cone ($5.35). I ordered a second time after the girl (and I do mean still in middle school) took my order the first time only to move on to the customer behind me. With cone finally in hand, I settled in to one of two cozy booths near the entrance. Salt Spring and the summer was easily clear when a group of kids stared through the front window in the same manner as I once did with the Eaton’s Christmas window displays. E: For the same price, I savoured a raspberry milkshake. I could’ve gone for the rose-flavoured gelato but I wanted to know the ingredients before ordering. Samplers are offered and sadly, the girl behind the till wasn’t privy to that knowledge. If it had the essence of rose along with petals, I’d be all over it. Instead, I marvelled at the exotic flavours being offered, like Strawberry Lavender, Toasted Praline and Dolce Latte. J: Harlan’s is known for more than just their gelato. They sell their own in-house made products, namely chocolates molded into various shapes, and some very cool candy (I want the Miner’s Nuggets). This establishment was originally owned and run by Harlan and his daughter. Even though there are new owners now, this place appears to retain its traditions. You’ll never know who you’ll meet in Harlan’s. It was a pleasant surprise to bump into Jennifer and John, co-owners of Victoria’s Spoons Diner. John was getting his helping of Whiskey Cream gelato. I wonder if one needs to provide valid ID just to taste it. This entry was posted in Food, Reviews and tagged Chocolatier, Desserts, Salt Spring, Sweets. Bookmark the permalink.